Morocco is a North African country bordering the Atlantic Ocean and the Mediterranean Sea, is distinguished by its Berber, Arabian and European cultural influences. Marrakesh’s walled medina, a mazelike medieval quarter, offers entertainment in its Djemaa el-Fna square and souks (marketplaces) selling traditional ceramics, jewelry and metal lanterns. The capital Rabat’s Kasbah of the Udayas is a 12th-century royal fort overlooking the water. A journey into the Sahara can be as varied as the desert itself, but there are some quintessential Saharan experiences. Travel in the Sahara is best between October and April or early May when daytime temperatures are generally bearable. Merzouga is a village in the Sahara Desert in Morocco, on the edge of Erg Chebbi, a 50km long and 5km wide set of sand dunes that reach up to 350m high. Most people are here to take a camel safari into the dunes. The city has two old medinas, the larger of which is Fes el Bali. It is listed as a UNESCO World Heritage Site and is believed to be one of the world's largest car-free urban areas. Located by the Atlas Mountains, Fez has a Mediterranean climate, shifting from cold and rain in the winter to dry and hot days in the summer months between June and September. Fez is becoming an increasingly popular tourist destination and many non-Moroccans are now restoring traditional houses as second homes in the Fez medina. 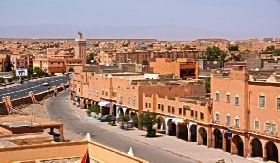 is a fortified city, or ksar, along the former caravan route between the Sahara and Marrakech in present-day Morocco. Most citizens living in the area now live in more modern dwellings in a nearby village, although there are 4 families still living in the ancient city. This giant fortification, which is made up of six Kasbahs and nearly fifty ksars which are individual Kasbahs, is a great example of earthen clay architecture. Aït Benhaddou has been a UNESCO World Heritage Site since 1987 and several famous films have been shot there. Chefchaouen is situated in the Rif Mountains, just inland from Tangier and Tetouan. The city is a popular tourist destination because of its proximity to Tangier and the Spanish enclave of Ceuta. Chefchaouen is a popular shopping destination as well, as it offers many native handicrafts that are not available elsewhere in Morocco, such as wool garments and woven blankets. The goat cheese native to the area is also popular with tourists. Marrakech is a major city in the northwest African nation of Morocco. It is the fourth largest city in the country after Casablanca, Fes and Tangier. The Jemaa el-Fnaa is one of the best-known squares in Africa and is the centre of city activity and trade. It has been described as a "world-famous square", "a metaphorical urban icon, a bridge between the past and the present, the place where Moroccan tradition encounters modernity. Marrakesh is possibly the most important of Morocco's four former imperial cities. Today, we start our private Morocco tour driving towards Ouarzazate through the Tizi Ntichka pass over the High Atlas mountains, you will appreciate the beauty of the landscape on the twisted road through the Berber villages. We'll get to Ait Benhaddou village, where we visit local Kasbah built in 19 th century by the last Berber chief Ethami El Glaoui. The Kasbah is a UNESCO historical site. After lunch here we continue to Ouarzazate, called “Africa Hollywood”, where we will have the opportunity to visit local studio where many famous movies were shot : Gladiator, Kondon and Alexander the Great, The Mumie, Asterix. We continue to Ouarzazatte to visit Taourirt Kasbah. This night will be in a local riad / hotel in Ouarzazatte. Private Air conditioned 4x4 / Experienced English speaking driver / Guide. On the 2nd day of our private Morocco tour we continue towards Dades Gorges , and then we may visit Todgha gorge which is one the beautiful canyons in Morocco. Here we will have a ½ hour hiking trek in the gorge. After that we will drive through few Berber villages. We will pass Ziz valley near Erfoud, which is famous for its fossil products and Rissani. Later today we reach Merzouga from where you will enjoy camel trek to the desert. We stay overnight in a Berber desert tent in the middle of the sand dunes. We will watch sunset over the Sahara desert dunes. The third day of our private Morocco trip starts by exploring area around the dunes of Erg Chebbi. 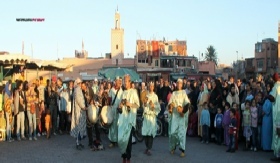 We will visit a Berber family and also Khamlia village ,where we listen to Gnawa music. We will visit Berber nomads and oasis of palm trees in neraby area. After lunch in Merzouga we ride camels in the sand dunes to reach desert camp. We will spend this night in desert Sahara camp where we will enjoy Berber drums music in the middle of the Sahara. You will also enjoy the sunset and sunrise in desert. After traditional Moroccan dinner we stay overnight in desert tents. After the return from the dunes, you will drive to Rissani, Erfoud and then all the way to Atlas mountains. We pass Midelt, Azrou, Ifrane to reach Fez where our private Morocco tour finish. The tour itinerary can be modified according your requirements and budget. Contact us if you wish to modify this private Morocco tour.